The world has changed in myriad ways — huge and subtle — since I grew up. When I was a kid, none of us, regardless of how much money our parents had or didn’t have, got everything. You wanted everything, sure, because kids always want everything … but you got something. In my house, since we didn’t celebrate Christmas, birthdays were the big gift-giving day. Each year on my birthday from when I was three until I was eight, I got one really nice doll. 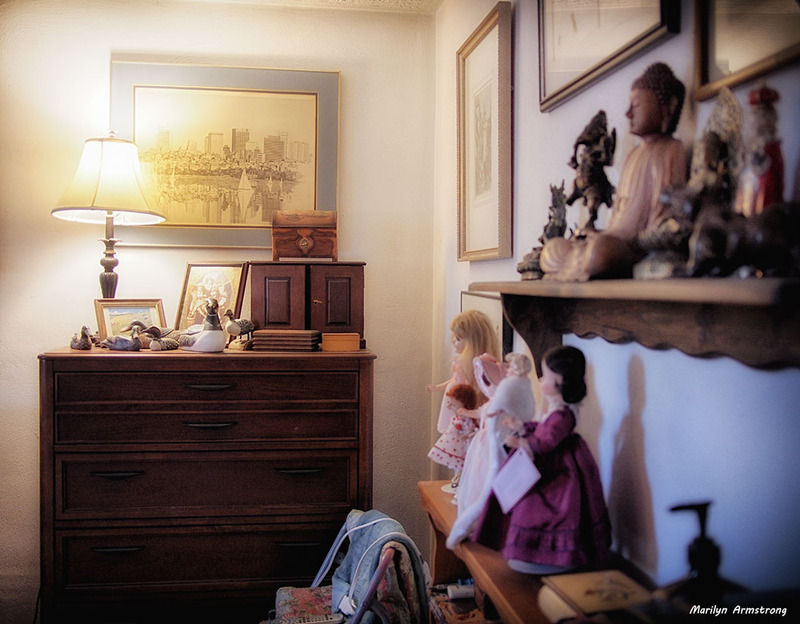 When I was five, I got “Annabelle,” the 1952 special doll from Madame Alexander. She would be my favorite for the rest of my life. Over her long life (she was born in 1952) she has been rewigged, restrung, repainted, and redressed half a dozen times. I really played with my dolls. They were my friends. I talked to them. I told them everything and I took them everywhere. Everything I did, felt, hoped for, and feared, my dolls knew. When I was six, I got Toni. She was Revlon’s “flagship” girl doll with hair that could be “permanent waved” using a doll version of the Toni Permanent Wave kit. The set was just tiny plastic rollers and sugar-water and they didn’t really curl hair. They just made it sticky … which attracted ants. So then you had to wash it and you were lucky if the wig didn’t come right off her head. There was Betsy Wetsy — also from Revlon, I believe (Tiny Tears was made by American Character). Those were the memorable dolls. Lots of little 8″ Ginnie dolls too and too many outfits to recall. Ginnie was in my day what Barbie was to the next generations of girls. It is perhaps a reflection of how the concept of girlhood changed during those years. By the time I turned 9, it was all about books. From then on, I got books for my birthdays, though usually one other “special” thing too. One year, my beloved bicycle arrived. It was much too big for me to ride. I was a tiny wisp of a thing, but also, the only 9-year-old with a titanium frame Dutch racing bike. I had blocks on the pedals and I had to ride standing up because no way could I reach the seat or use the coaster brakes sitting down. But I grew a few inches. So, by the time I was an adolescent, I could reach the pedals without help. And, I knew I had the greatest bike ever. Tiger Racer and me … we flew! I slept with my dolls. As I headed into my 50s, I began searching for the dolls with which I had grown up. Collecting is insidious and doll collecting even more so. I developed a bizarre lust for dolls. I didn’t know I had become a collector until I began to buy reference books so I could identify dolls by model, year, manufacturer, etc. Reference book are the significator of any kind of collector. When your reference collection is far more complete than the local library, you are a collector. Accept it. Deal with it. These pictures are a sampling of the dolls. I tried to capture something of that ephemeral sweetness the dolls of my generation had. Perhaps show a hint of why they still give me a warm glow when I look at them. They never argue, always forgive. And they never complain and don’t mind if you drag them around by one leg with their foreheads scraping the sidewalk. Yesterday, while cleaning, I stood up and my shoulder connected with the glass-fronted curio cabinet. I knocked a shelf and the aforementioned cabinet entirely off the wall. There was a loud crash. It wasn’t the noise that distressed me. 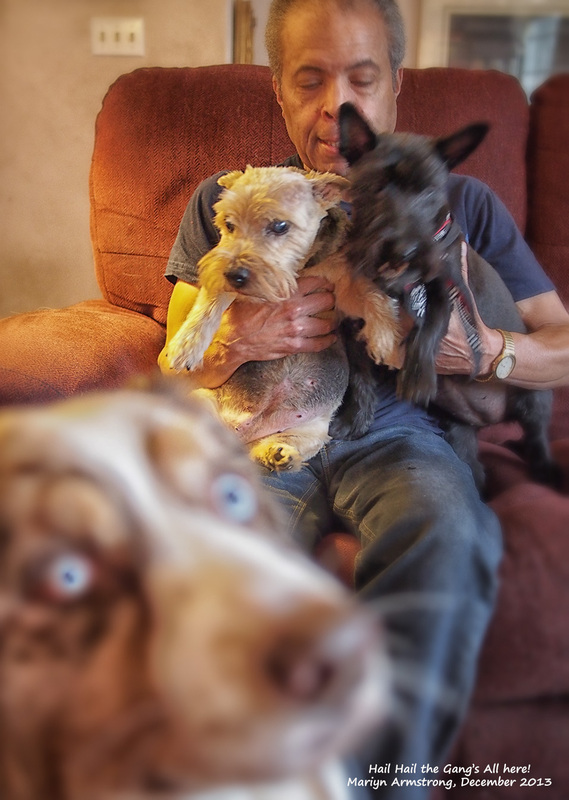 It was what that noise meant … that I was about to incur serious losses. I used to collect things. Pottery — Navajo, antique Chinese and Japanese — and antique sacred Asian art (mostly statues ranging from pretty big to very tiny). Hard-plastic strung dolls of the 1930s, 1940s, and 1950s with a smattering of newer girls from the sixties. Tiny stuffed bears. Native American carved fetishes with a strong leaning towards Corn Maidens. And art. Paintings, photographs (not just mine, but other artists). Musical instruments. Wind chimes. Teapots. There’s more. My husband’s baseball with autographs of the entire Red Sox organization of the 1970s, including Ted Williams. A Russian Matryoshka doll (the kind with all the little dolls inside each other). 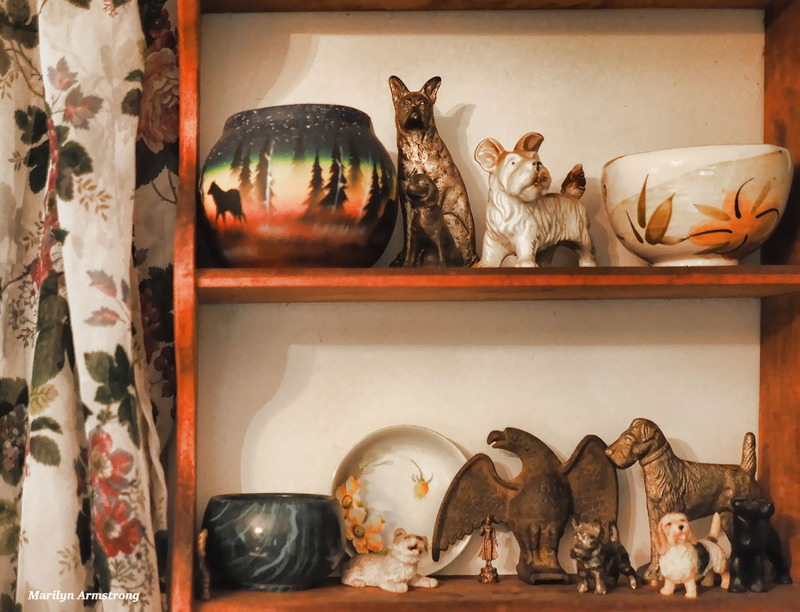 The glass-fronted cabinet and one shelf in the living room contain many of my favorite small pieces. With all that we gave away or sold, the house is too full. At least most of it is on shelves and (presumably) out of the way. And safe, isn’t it? We put up a LOT of shelves, pretty much anywhere they would fit. The dolls are on shelves as is pottery, fetishes, and the small bronzes. When those two shelves crashed to the ground, first bouncing off a small table and smashing some lovely Italian glass, I could only imagine the carnage. I’m surprised anything survived. 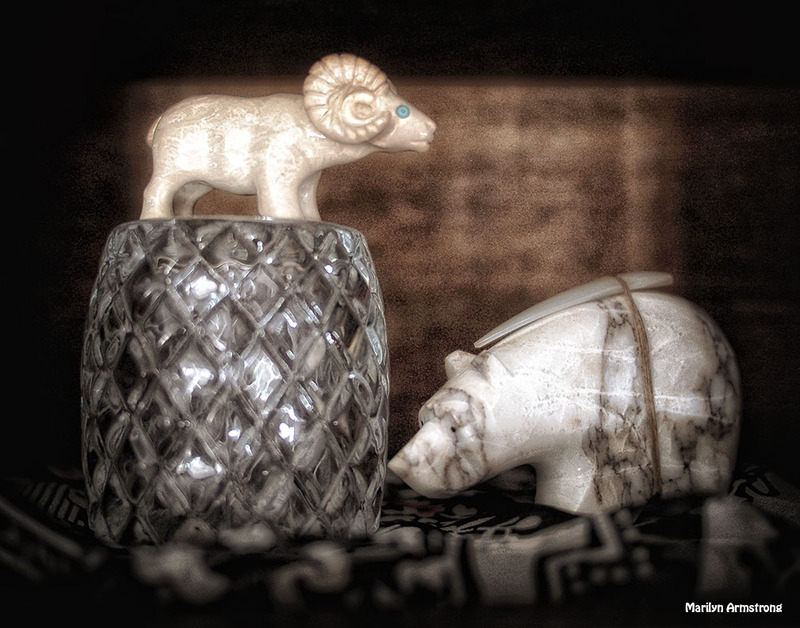 Of the two Navajo pots, one came through without harm while the other was reduced to shards. 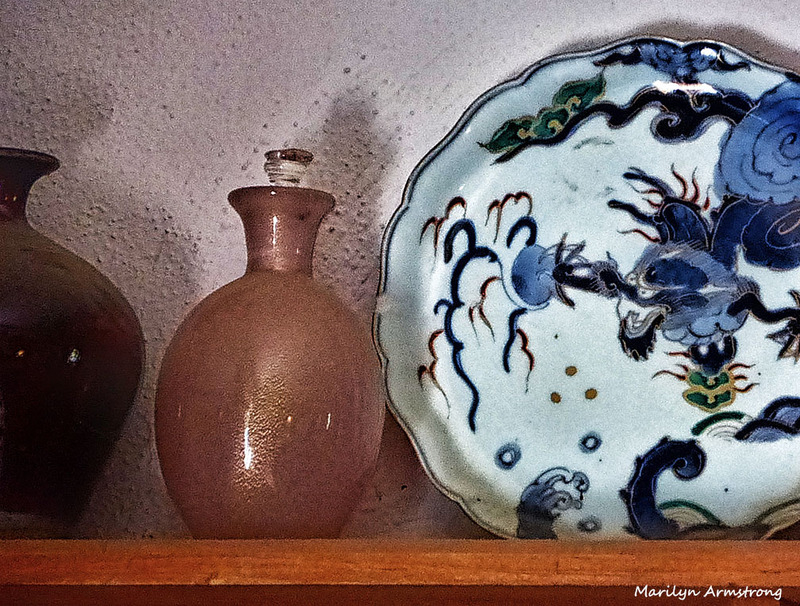 Two very old Chinese porcelain vases– one little black one from the 12th century and another from the Jian dynasty (probably 16th century), plus a lovely little “story” dish, probably 15th century, were smashed beyond saving. The bronzes were unaffected, though the shelf barely survived the fall. It was my fault. Entirely. No one else did anything to cause the massacre. It got me to pondering the transitory nature of things. Antiques would not be so valuable if they didn’t get broken, destroyed, lost through the years. 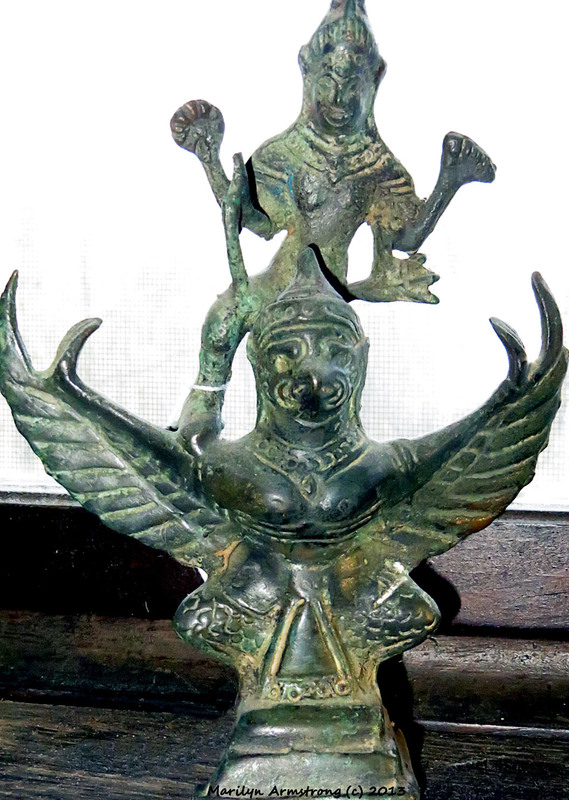 If everything survived through the generations, there’s be no scarcity of ancient artifacts. This line of thought is actually not very comforting. On the shelf, I thought they were safe. Out of harm’s way. My only enemy was the eternal, unavoidable dust settling on everything. It turns out, I am time’s enemy. 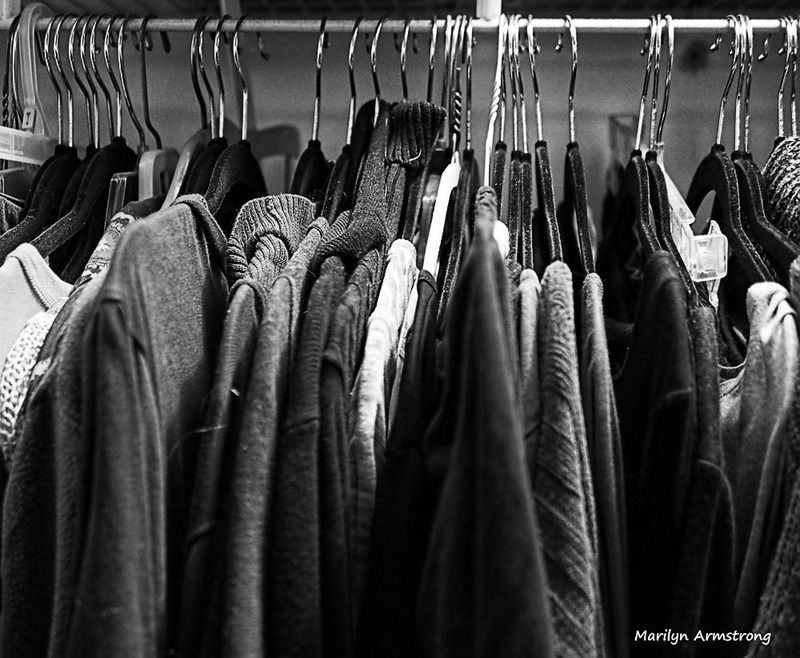 I am a collector of everything. 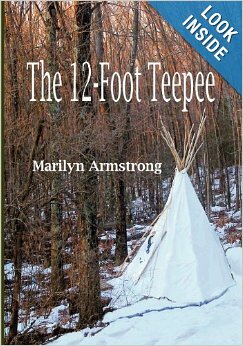 Dolls, Native American jewelry, fetishes, and pottery. Cameras. Ancient Chinese Porcelain. Asian sacred artifacts. Wind chimes. 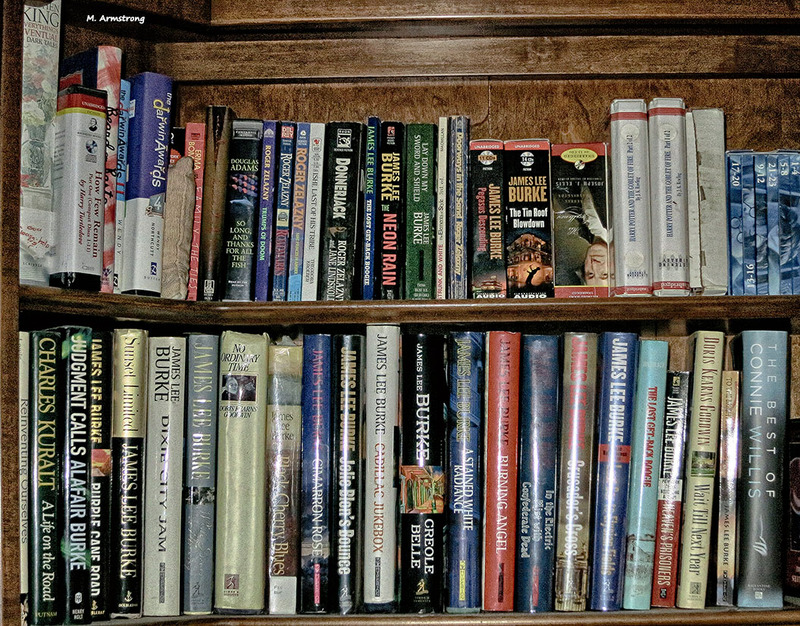 First-edition books (new ones, not old ones). Musical instruments. And a lot of miscellaneous stuff that just appeals to me. Now, if only I could collect my thoughts. They seem to be all over the place. Fiction, science fiction, and history. I consider biographies as history. I read auto-biographies of people I think might prove interesting. Sadly, many of them are not interesting at all. A tree. Near a brook. In a meadow. It is not leftovers that have stayed too long in the refrigerator. 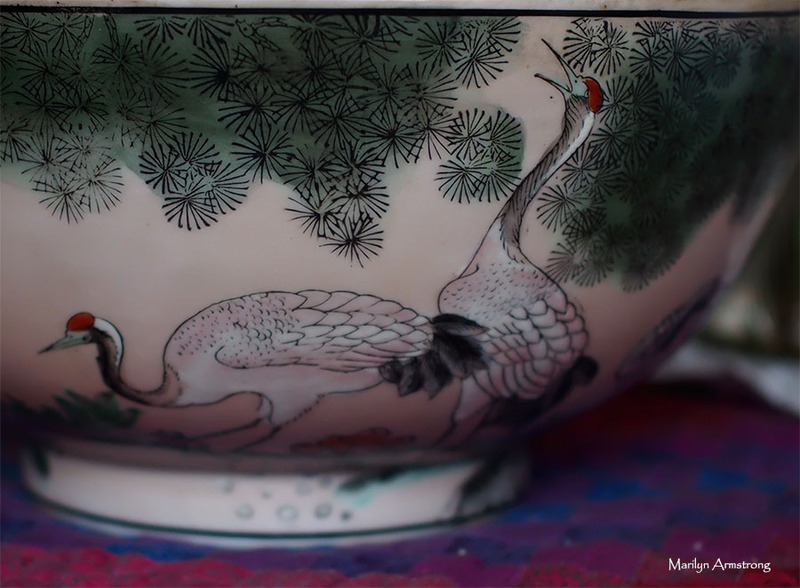 You may know (or not) I have been a collector — in a small way — of antique Chinese porcelain and Asian art. As a collector, I love flea markets and yard sales. It’s part of the collecting mystique, that one day someone will be selling a great antique piece for a few dollars and I will be there to grab it. It happened. Twice, to be exact. 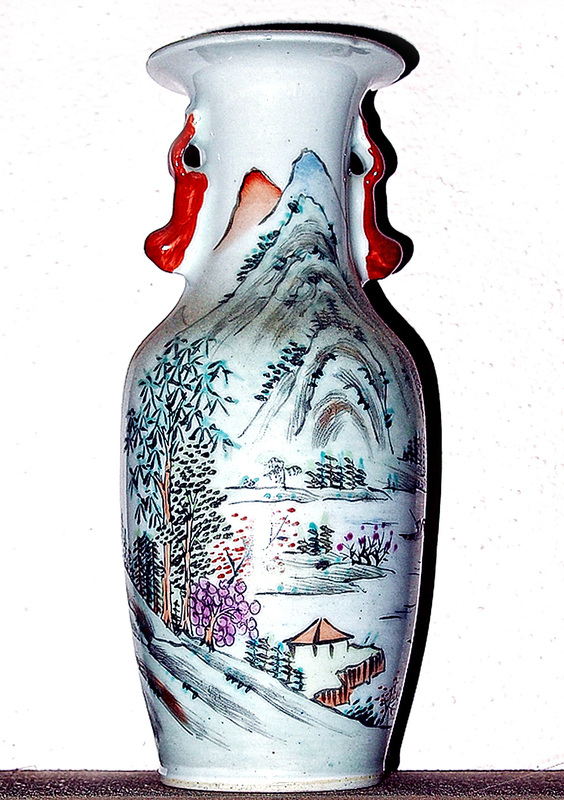 One pieces I got was a small, 200-year-old Qing dynasty pitcher. In pretty good shape. Got it for five dollars, sold it for $150. Ka-ching! The other was a little dish which I’ve kept. It’s decorated with blue and yellow chickens. It’s a rice bowl, the sort of thing a working man might carry to work and use to eat his lunch. The piece fits loosely into the category of famille rose. Or famille verte. I haven’t decided if rose or green is the dominant color. They are both a style rather than a dynasty, though the vast majority of piece in this category are between one and two hundred years old. Most of these pieces are elaborately decorated, but simple pieces were made for regular folks. Chinese porcelain was secular. Art for art’s sake. Decorative. 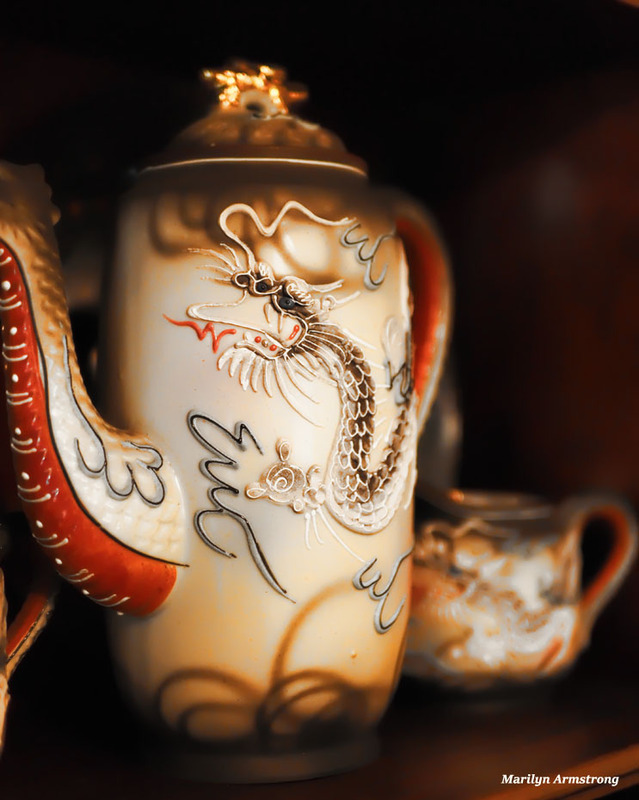 Non-collectors may assume Chinese porcelain was lavish. What I would call “imperial porcelain.” Certainly some very fine porcelain was made for the wealthiest members of society, but much of it was not. The Chinese were very egalitarian, believing that everyone needed art, the same way everyone needs food. Food feeds the body. Art feeds the soul. Art — dishes, figures, vases, ginger jars and so much more — was made for peasants, servants. Middle, and upper classes. Beauty was not a privilege of the few, but part of life for everyone. The concept of art for everybody delights me. Too many people think art is a waste of money because it has no “function.” Merely being beautiful isn’t enough for them. In this bowl indeed has a function, but it wasn’t painted to make it more functional. It would hold a man’s rice without hand-painted chickens. But me? I prefer it with chickens. In fact, I just love those chickens! We do not allow animals in our house. We don’t even like them. I don’t collect anything. Nothing. Never. Our home is clean and uncluttered. What are the winning numbers for tomorrow’s Power Ball drawing? A brand new house with no stairs and a really GREAT kitchen.